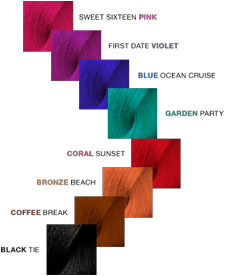 Products: What to choose for a fancy colour? What to choose for a fancy colour? The success story of hair make up. Pioneering product of the trend, the ephemeral colour brings a very personal touch to your mane. The goal is to make your hair a fashion accessory! 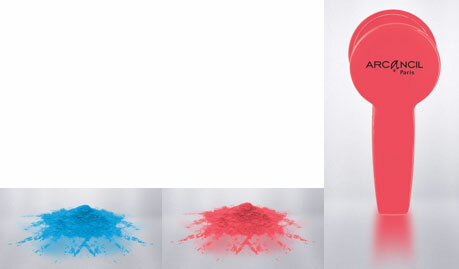 Ever more innovative in terms of creativity, all colours are available from the most discreet to the flashiest effects. The big advantage is that the colour fades with shampoo, then you can create styles to infinity and do not damage your hair... The application is simple and fun, in brief it is you the artist! Let your imagination surprise yourself; fashion will inspire you for sure. For the rest, Collection Hair combines the most interesting product that will succumb to all the original features. Find our inspiration in the "Styles & Inspirations"
The first Make-up Hair from L'Oréal Professional offers a range of 8 colours to easily make up a few strands. The most daring or the wisest your hairdresser will advise you the most appropriate look! To taste in hair salon and reproducing at home, this colour disappears only after several shampoos. For all hair types, colours are bright in one application! Collection Hair tips: wear gloves while applying as the product can mark the skin and nail. Great inventor, Kevin Murphy has declined a real best seller whose brands were inspired. 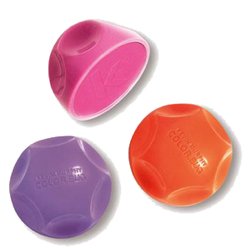 Thanks to its ergonomic applicator pad, a simple gesture is enough to brighten up your hair into gorgeous pastels. Is easily removed from washing, Color Bug ads volume and body to the hair. Ideal for a fancy event, it turns into ephemeral makeup. Available in Pink, Yellow, Orange, White, Purple and Shimmer we can play with subtle contrasts after applying the first coat or sustained after several applications. Collection Hair tips: cover your shoulders with a towel during application to protect your clothes, first apply a light styling product that chalk adheres better to the hair or finish with a fine mist of hairspray to fix on the colour. Infinity of bright colours that even a chameleon would be jealous! Lilac, Emerald Green, Lavender, Burgandy, Candy Floss and many others that there really are choices for all tastes and colours! The tint is semi-permanent, it fades in time but stay enough to not do apply it again every week. More your hair is light, more the rendering is flash. Can be applied as a shampoo for a total look or appropriate areas (on the ends, fringe...). Be carful the product is quiet liquid. Collection Hair tips: If you want to fade the color faster, wash your hair with anti-dandruff shampoo and rinse with hot water. Simple and easy this little pastel shalk sneaks around as your makeup. Three colours: Pink Lilac and Turquoise to create a slight hint of shades in your hair. This discreet makeup is glittery and goes off after one shampoo or even just water. It’s seems ideal for little girls or to try a soft fantasy. Collection Hair tips: when using, do not touch your face because the glitter catch the skin and hair. 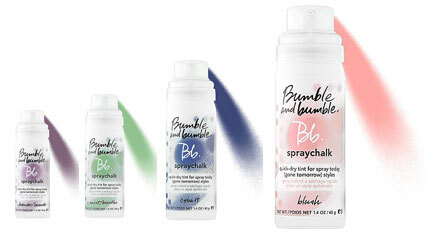 To stylize all the craziest hairstyles, Bumble & Bumble has designed a quick dry tints for spray. 4 colours to choose for a powdery effect that threadbare first shampoo. 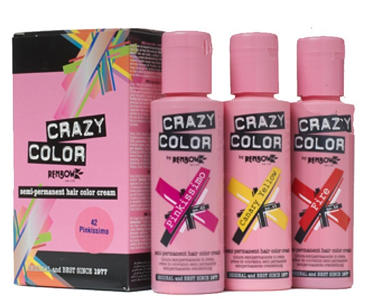 Very precise it is used as a simple hairspray and can add up to create a rainbow of colours. The clip that takes your hair and colouring it, very smart and super easy. The iron gestures is reproduced by squeezing a strand that need to be tint and voila! Available in 2 hues only, Coral and Blue are still the most fashionable colour of the moment. 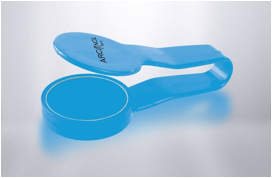 With a plastic cover, the case powder closes securely to carry around. It will follow you everywhere and will be removed after rinsing with water. Collection Hair tips: to hold the product, apply some hairspray. If you want to get a flashy effect, multiply the applications.